Two to four CCRTA scholarships worth at least $1000 are given every year to a current college sophomore or junior who is a resident of Clark County and has graduated from a Springfield City or Clark County Public School System. The number of scholarships awarded vary according to funding. CCRTA members donate toward scholarships. Outside education-oriented organizations also provide funding. Application Process: The application process begins January 15 and ends no later than March 20. The applicant must be an education major and have earned a minimum 2.5 grade point average, including the most recent past term. The recipient is notified in early May. For a Downloadable Form, Right Click on: Application Form. Mail completed application to Mr. Carl Ahlm. The CCRTA Scholarship Committee also assists CCRTA members who want to offer individual scholarships but do not wish to be involved in the process. The Committee takes cares of the entire scholarship process for the donor, including providing an application, reading the results, selecting the recipient and naming the scholarship in honor or memory of the person of the donor's choice. Five local college students have been awarded $1000 scholarships from the CCRTA. Recipients were chosen based on recommendations, grade point average and a short essay. Neal E. Weber Memorial $1000 Scholarship funded by the Dr. Brian Weber family: Sydney Peters, senior at Wright State University, majoring in Middle Childhood Math and Social Studies. Neal E. Weber served on the Clark-Shawnee Board of Education for 34 years. Gail Davis, Jeanie Braun and Ann Martin Memorial $1000 Scholarship: Megan Caldwell, senior at Wright State University, majoring in Early Childhood Education. Heartland Federal Credit Union and Anonymous Donor $1000 Scholarship: Sara Hart, junior at Wright State University. Wallace and Edna Smith $1000 Scholarship: Taylor Horton, junior at Wittenberg University, majoring in Early Childhood Education. Randy and Betty Milner $1000 Scholarship: Chelby Dye, junior at Wittenberg University majoring in Early Childhood Education. Held every other spring, this activity is directed toward active educators, particularly those within ten years of retirement, in each public school district in Clark County. A professional representative from the State Teachers Retirement System (STRS) facilitates the ninety-minute session that covers retirement basics, health care issues and funding. STRS also provides workbooks and worksheets. Location is the Heritage Center in downtown Springfield. Next pre-retirement meeting will be in Spring of 2019. Contact: Vickie Williams, Pre-Retirement Committee Chair. This project is the hallmark of the CCRTA. The one room school house provides students within the Clark County school districts an opportunity to experience a typical school day in 1897. Materials and activities follow Ohio Benchmark Standards while also reflecting the time period. All work involving building renovation, land renewal, including providing all the period furniture, school materials, and teachers in 19th century costume as well as field trip scheduling is done through volunteers from CCRTA. Link to Membership Activities for more information. Contact: Connie Bost, One Room School Committee Chair. Link to http://www.AdvanceOneRoomSchool.blogspot.com/ for more information, history and photos of the Advance School. Helen Brumfield has been an active volunteer for the Salvation Army for over 50 years. During the CCRTA general membership meeting in December, Helen passed around the Salvation Army's trademark red kettle. CCRTA's donations to this vital organization helped ensure the welfare of the community's needy adults and children. *In 2018, Helen announced her retirement as a volunteer and passed the kettle for the last time. She raised over $1000 from the always generous members of the Salvation Army. The Ohio Retired Teachers Association collects volunteer hours from local chapters for its state records. CCRTA members keep track of individual hours and projects on a monthly basis and turn in a yearly total by December 31. Include travel time in your volunteer calculation. 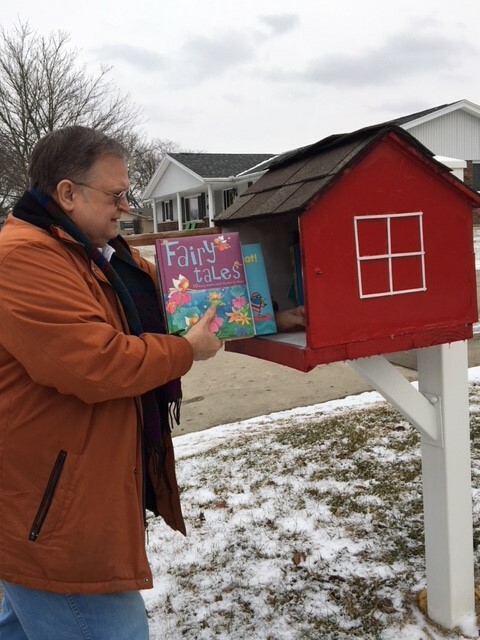 The two chairs of the Scholarship Committee supply over twelve birdhouse libraries scattered throughout Clark County. 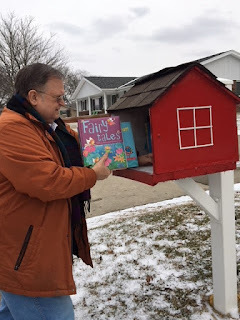 They collect books for elementary to young adult readers from CCRTA members and friends and distribute them to the little library boxes throughout the year. In 2017, over 600 books had been distributed. Each book includes a sticker which reads it has been donated by the Clark County Retired Teachers Association. Carl Ahlm, co-chair of the Scholarship Committee.